Note: An MAU cannot be a subaward in another MAU's proposal. The UA System is considered one organization with a single accounting system and therefore does not have an internal subaward mechanism. 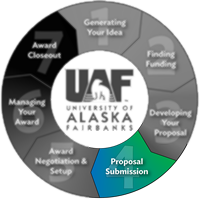 Therefore, UAF cannot be a subaward to UAA or UAS, UAA cannot be a subaward to UAF or UAS, and UAS cannot be a subaward to UAF or UAA. Each MAU enters their portion into Banner FRAPROP. See "Banner FRAPROP Entry" for more guidance. This means each portion will have its own 'S' number. Each MAU should use their F&A rate for their portion of the proposal. The proposal budget should combine all line items for the MAUs involved, with separate MTDC lines for each MAU's F&A recovery. A separate spreadsheet budget for each MAU and a combined budget should be included to show the breakdown of work and funds requested. Each MAU must submit a signed routing form from their campus to the lead MAU to ensure proper approvals. Note that this is done on each MAU's respective form. For NSF proposals, the easiest and most compliant solution is to prepare a collaborative dual submission: each MAU's budget is entered separately, the proposals are linked in FastLane, and awards are made to each MAU separately for their portion of work.